If anyone here uses facebook there is a page called marketplace where you can search for shoes / other products for cheap prices. 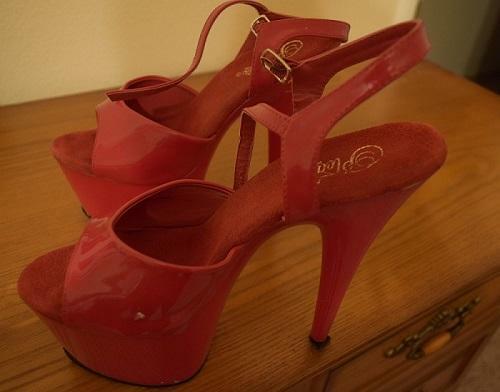 I found some high heels that someone was selling about few miles away from my house. You can specific a location and how many miles you are willing to drive and find some nice priced High Heels. I do wear heels only at home but i wouldn't do it in public only if there was a community of men who would would wear them and I would be part of it in my area and we meet every so often. I don't think so, because what society thinks of men wearing heels versus women wearing heels is different. If society changes there thinking and adopts this idea that men can wear heels just like women and it becomes reality then maybe in the long run it can work. But I dont think. Women have there own characteristics style and femininity that is what is portrayed in society and men have there own masculinity. Yet some men do love to act feminine, but some people might be offended for that if they saw it in public. I dont mind for men to be able to wear heels in public and express themselves the way they like. if more men would do so i would be encouraged myself as I love to wear heels. Amazing look wow. More men like you should flaunt this style.